After mulling for weeks about how to finish the ceiling on our straw bale cottage, we still couldn’t decide what to do. Should we go with drywall, the (cheap) material of choice for nearly everything built these days? Or tongue and groove wood, which would definitely look amazing, but would cost at least 4-5 times more. As we wrestled back and forth, an opportunity fell into our lap. While hunting for a bathroom vanity at the Finger Lakes Reuse Center, we noticed that they had reclaimed barn boards for sale at a very reasonable price. Before long, we were driving back to the Dacha with a truckload of miscellaneous planks, most of them oak from 60-80 years ago. The boards were a dull gray on the outside, with a thick layer of dust and the occasional worm hole. They looked dingy, about what you’d expect for a plank that’s been in use inside a barn for the larger part of a century. You could still see deep saw marks from now-antiquated milling equipment. 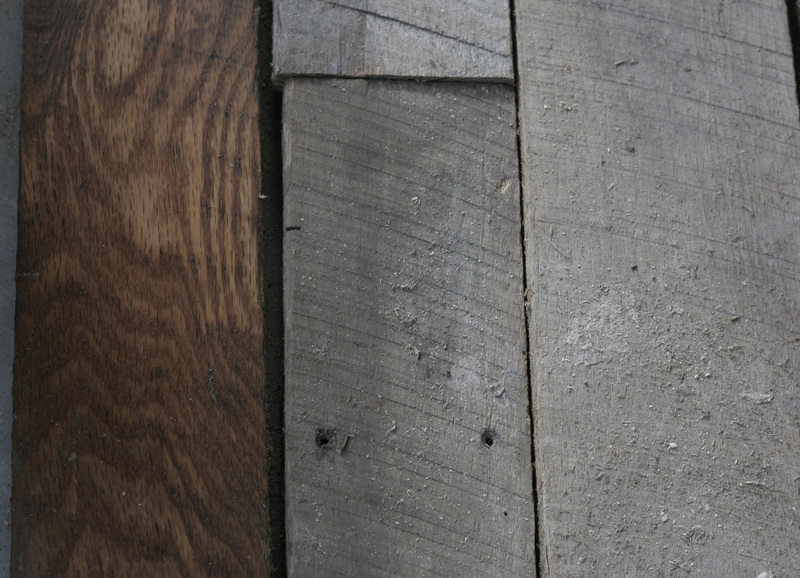 We purchased some old for-cheap barn boards from the Fingerlakes Reuse Center to throw up as the ceiling of the straw bale cottage we built. Check out what some sanding and polyurethane and/or linseed oiling can do to a board. Will post photos of completed ceiling when that happens.